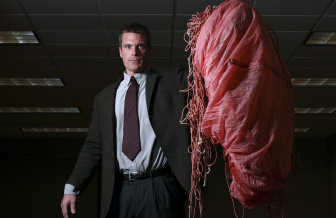 Next to it are a few deteriorated bills and a pink parachute discarded after Cooper cut its strings to secure the money. A padded envelope protects his tie – a black J.C. Penney clip-on – from which authorities gained a partial DNA sample. But in the 36 years since Cooper’s jump, the FBI has gained little more hard evidence – save about 20,000 documents, mostly from dead-end leads. Still, the story has become local folklore, intriguing amateur sleuths as well as agent Larry Carr, who asked to be the case investigator earlier this year. “I think D.B. Cooper died the night he jumped,” said Carr, sharing the belief of case agents before him. Forman said a friend of his – who was a loner, like the FBI described – confessed to Forman and his wife. The friend, who looked similar to the FBI sketch, was a proficient skydiver, an expert with dynamite and mysteriously disappeared in the days around the hijacking. Forman believes the small amount of money found in 1980 deteriorating on a Columbia River bank – the only money ever found and linked to Cooper – was planted by Dayton to spark interest in the case.